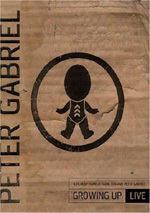 Peter Gabriel: Growing Up Live presents the complete 2003 Milan concert from Peter Gabriel's tour based around the album "Up", featuring 17 tracks across 134 minutes. Boy, that effort must have really drained him, for Pete’s next album – entitled Up - wouldn’t hit the shelves until about four and a half years after the theatrical release of Angels! No, I don’t actually blame Angels for the delay. Pete obviously had been at work on Up for quite some time prior to the film. In fact, “I Grieve”, his contribution to Angels, appears on Up, albeit in a different version. I don’t know why it took Pete 10 years between albums. Us came out in the fall of 1992, and even that seemed like an eternity since its predecessor, 1986’s So. Allegedly Pete has so much material left over from Up that another album – perhaps entitled Follow-Up - will supposedly come out soon. I’ll believe that when I see it. At least Up led Pete to hit the road for the first time in eight years. The “Growing Up” launched in the fall of 2002. It began as a simple theater performance – I think designed for Pete to get his feet wet after so long – and soon became an elaborate indoor arena show staged in the round. “Growing Up” spent most of its time that way, but when Pete came back to the US for a second leg in the summer of 2003, he scaled down the concert for outdoor amphitheaters; many of the same components remained, but without quite the same level of ambition. On this DVD called Growing Up Live, we find one of the large arena shows. Shot over two nights in May 2003 at the Filoforum in Milan during May 2003, Growing Up ably documents the show before it hit the amphitheaters. Not surprisingly, the concert focuses most heavily on songs from Up. Six of its 17 tunes come from that album: “Darkness”, “Sky Blue”, “The Barry Williams Show”, “Growing Up”, “More Than This” and “Signal to Noise”. The remaining 11 tracks come from a mix of sources. Not released in the US, the millennium project Ovo produces “Downside Up” and “Father, Son”, while “Animal Nation” comes from an unlikely source: the Wild Thornberrys Movie. Us offers “Secret World” and “Digging In the Dirt”, while the smash So provides “Red Rain”, “Mercy Street”, “Sledgehammer” and “In Your Eyes”. Finally, “Here Comes the Flood” and “Solsbury Hill” both emanate from 1977’s Peter Gabriel. Back in the Seventies with Genesis, Pete made his name as an elaborate showman, and Up continues that trend. Performed in the round, the visual aspects of the concert focus on the center of the stage, from where objects lower. For example, during “Growing Up”, a “hamster ball” comes down; Pete enters it and rolls it around the stage. Most of the songs stay with more subdued visual elements, though. Pete offers enough theatrics to spice up the show, but he doesn’t rely on them to an extreme. Part of me wishes he’d done more of that sort of visual material, but part of me feels satisfied that he didn’t go nuts with gimmicks. At least Growing Up adds “Here Comes the Flood” to old stalwart “Solsbury”. Still, it’d be nice to hear Pete broaden his repertoire more to rely less. I’m happy to get a substantial amount of new material, but I’d prefer less So. I know it’s his biggest album, but it still doesn’t need to feature quite so prominently. Pete got into pre-1986 hits like “Shock the Monkey” and “Games Without Frontiers” during the 2003 amphitheater shows, and it’d be good to see him expand to some less well-known numbers as well. Pete literally looks like a different man in 2003 compared to 1993. With more to his waistline and less to his hairline, you’d be very hard-pressed to recognize him. Though this might startle folks, I must admit it’s nice to see a rock star who doesn’t obsess over his appearance and who accepts his aging. Pete could have gone the hair plug route but obviously didn’t think it mattered, which it doesn’t. Pete seems a little less active on stage compared to the old days, and I don’t think we’ll see him crowd surf like back in the Eighties. Nonetheless, his command of the stage remains. Some performers simply look like they’re in control of things, and Pete displays that attitude. This means that even when he stands still, he makes things interesting; he can communicate more with a glare or a hand gesture than other performers relate in entire shows. For the most part, Growing Up goes with a simple and fairly effective visual presentation. Director Hamish Hamilton depicts events concisely and without too much quick cutting or gimmicks. Some exceptions occur, though, such as the occasional use of split-screen. This mostly happens between songs and allows us to see the action onstage as well as behind the scenes material. This occasionally becomes a minor distraction, but not to any substantial degree. Overall, Growing Up offers good documentation of a good concert. Neither side of the equation seems outstanding, as I’ve seen better live shows and better performance DVDs. Nonetheless, this one maintains a high standard of quality across the board and presents a satisfying piece. Growing Up Live appears in an aspect ratio of approximately 1.78:1 on this single-sided, double-layered DVD; the image has been enhanced for 16X9 televisions. When I saw that Hamish Hamilton directed Up, I feared the worst. He helmed projects like Madonna’s Drowned World Tour and U2’s Elevation, both of which offered surprisingly ugly pictures. Happily, Up seemed much more satisfying, as it presented very attractive visuals. I will notes that some quality declines appeared at times. Various forms of interference appeared during “The Barry Williams Show”, but this was intentional, so I didn’t consider this to be a flaw. Some songs featured lower quality cameras for a few shots as well; for example, as Pete cycled around the stage, a camera viewed him from the handlebars, and it also resulted in less than stellar images. I didn’t think it was fair to lower my grade due to these factors, though, as they became inevitable. Since Pete and band dressed totally in black, the majority of the colors came from lighting. Those hues looked well developed and accurate. Even the thickest lighting remained distinctive and rich. Blacks were deep and dense, while low-light shots came across as clear and appropriately visible. Growing Up wasn’t the most attractive concert DVD I’ve seen, but it nonetheless seemed very positive. Growing Up featured both Dolby Digital 5.1 and DTS 5.1 soundtracks. Each one worked well, but I definitely gave the nod to the DTS one as the superior version. I’ll discuss it first and then relate why I preferred it to the Dolby edition. The soundfield seemed smooth and well rendered. Vocals stayed nicely centered as the music swirled around Pete. Instruments spread cleanly across the front and seemed appropriately placed. It was easy to isolate each one, as they seemed nicely delineated. Surround usage mostly leaned toward crowd noise and general reinforcement of the music, though it seemed a little more active in that regard than most concert programs. The mix occasionally went gimmicky, such as during “The Barry Williams Show”, which panned electronic noises in the rear at one point. “Growing Up” also used the rear speakers pretty actively for vocals, synthesizer, and even some guitar. For the most part, though, the surrounds accurately and solidly supported the front but didn’t cause distractions. Not only did the track present a very well defined soundfield, but also it offered stellar audio quality. Vocals consistently sounded warm and natural. Happily, the producers resisted the urge to give the singing a thin reverberation to simulate the arena experience, so the vocals seemed distinctive and detailed. All instruments came across as accurate and concise. Drums punched crisply, while guitars chimed nicely. Bass response seemed absolutely stellar. I can’t recall a concert program with such rich and lush low-end, and that depth gave Up a great sense of life. I don’t issue many “A+” grades for audio, but Up sounded so damned good that I couldn’t think of any reason not to do so. Growing Up comes with a smattering of supplements. First we get The Story of Growing Up, a nine-minute and 40-second documentary. 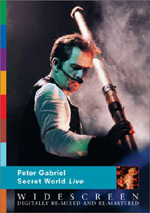 It presents images from the show while Peter Gabriel discusses the themes on display. He gets into the overall visual design for the stage and chats about various elements like the upside-down bit and riding the bicycle. Pete also lets us know a little about the band members. “Story” is too short to give us much depth, but it’s a nice little synopsis. Next we find Tony Levin’s Tour Photographs. This five-minute montage presents the bassist’s candid photos accompanied by an alternate version of “More Than This”. The package touts it as a remix, but it’s really a totally different take of the song, not just a mild reworking. That audio piece makes this area particularly valuable. For folks with DVD-ROM drives, they can access an interactive “Growing Up”. Unfortunately, this doesn’t provide an interactive version of the concert; instead, you can create your own remix of the song “Growing Up”. And you can do this in a flexible and versatile manner that’s a lot of fun. However, it’s a pain in the behind to find it. There’s no direct information about the interactive feature anywhere on the DVD. I had to go to the official Peter Gabriel site and do a search on its message board to learn that you need to head to www.noodleheaven.com to download the track. It’s worth the effort, but it shouldn’t be this damned difficult to find it. Finally, the package includes an unusual dual-booklet format. Open the tri-fold digipak and both the left and right sides present paper materials. On the left, we get photos from shows and band credits. On the right, we find behind the scenes pictures and tour credits. Both feature some nice shots and add a bit to the piece. Despite a long break from live performance, Peter Gabriel demonstrated he can still put on good shows, and Growing Up communicates his most recent tour nicely. The show doesn’t excel at much, but it seems consistently well above average and entertaining. 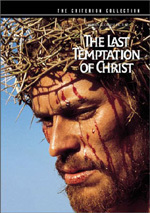 The DVD features excellent picture and audio plus a minor mix of extras. This is a solid package that comes with my recommendation for all Gabriel fans.